I've been working on Poles for Saga: Age of Crusades. Here's some Levy militia. I'm also working on some Baltic Pagans, so I can field both sides of the Baltic Crusades. I recently got to field these boys and their mounted counterparts in a game. I was using the Crusaders versus the Moors. We're waiting for the scenarios book, but until then we played the basic Clash scenario, with the random element table in the book. We rolled up a dawn fight, meaning the sun was just rising, reducing shooting range and charges to 6" until after turn 2. I had mounted Warlord, 8 mounted Hearthguard, 16 spear Warriors, 8 crossbow Warriors, and 8 mounted Warriors, while the Moors had a Warlord, 8 mounted Hearthguard, 12 bow Levy, and 24 spear Warriors. The terrain was a series of pools and patches of trees, probably representing an oasis. A good place for a fight. The first turn for the Moors was spent moving some units forward and amassing Saga dice, trusting in the safety of darkness. In my turn, the Crusader Hearthguard rushed forward, requiring 2 activations to get the charge on Moorish bow Levy. They crushed them handily, killing half, but at the cost of 2 members. Thus began my poor save rolls for most of the game. The Hearthguard survived a round of shooting from Levy and Hearthguard before charging the Moors elites. In a cascade of Saga abilities, the combatants separated with only a few casualties on both sides. The Moors then unleashed a powerful ability to javelin the isolated Knights, then charged the survivors, wiping them out. By sunrise, my army had lost 8 Hearthguard to 6 Levy and 3 Moor Hearthguard. Not a fair trade. A few half-hearted skirmishes between Moorish and Crusader Warriors did a little damage, while the Moorish horsemen launched repeated javelin hit and runs. If I didn't do something about them I'd be picked apart. With that in mind my mounted Warriors risked a charge right into the Moorish elite; the Serjents got chewed on but the Jinetes were wiped out. In response, the Moor Warlord charged the Serjents, but flubbed his rolls (at the same time as I finally made some good saves) and got killed. The game had seriously turned in the Crusaders' favor. A charge from my Warlord into some isolated Moorish Warriors and the surviving Serjents into the Moorish Levy sealed the deal. There's just something about a dude with a squirrel on his shield that makes me smile. Like if he were my enemy and I got the best of him in battle I'd be all like, "Awww, shucks. I can't kill you. Just go home. Your shield is adorable!" Have folks been trying out the Book of Battles for Saga? We've only touched the surface of the scenarios so far. We played the Feasting & Pillaging scenario. My Anglo-Danes versus the Scots. There were 3 objectives on the center line of the table; we had to grab them and run off our own table edge, while keeping our own forces intact (Surivival VP's plus 3 per objective held or 6 if we could abscond off the table with it). 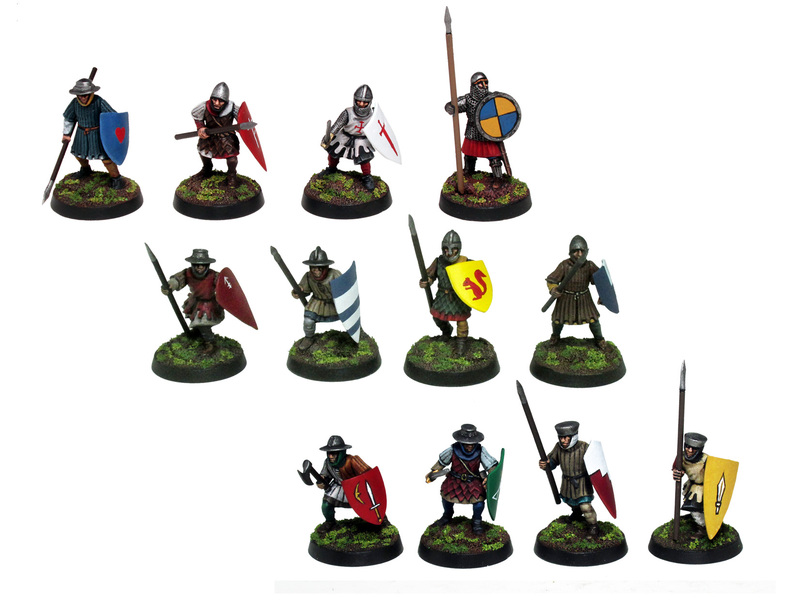 My Anglo-Danes (Warlord, 8 Hearthguard w/ Dane Axes), 24 Warriors, and 12 Levy archers) were on the left, the Scots (mounted Warlord, 4 mounted Hearthguard, 24 Warriors, and 12 javelin Levy) on the right. The hedges were just markers to denote table edges. Another shot of the deployment, and the objectives. Midpoint of the game. My Warriors had run up to grab an objective and survived some counterattacks, then ran off the table. The other Warriors unit with an objective got overrun and their loot stolen. The objectives changed up a lot of our tactical decisions; they slow anyone carrying them, so require more activations to get them off the table for max VP's. This of course costs you other units' movements or special rules, plus robs you of a unit you might need later. In the end, we both got an objective off the table, with the third held by a single one of my Hearthguards. Both our Warlords died fighting (mine run down by the Scots Warlord, the Scot killed immediately after by my Hearthguard). The Anglos came out of top, just barely. It was a brutal fight- hope the loot was worth it! 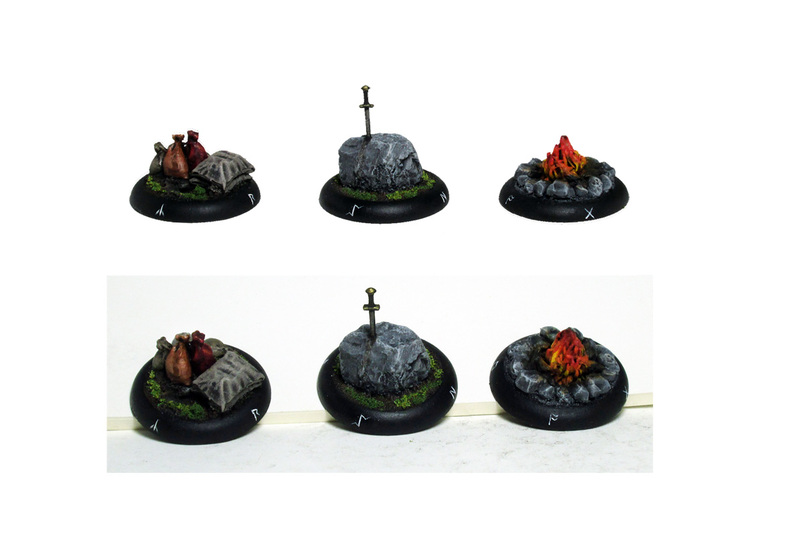 The first 3 objectives I've finished. They're on 30mm Privateer bases so they stand out from the 25mm GW-styles I use for my Saga figures. This Saturday I’ll be running a Saga Day at my FLGS. They get volunteers to be ‘Champions’ for their favorite games, to drum up interest and lure new players. I have started as the Historical champion, covering Saga, Bolt Action, Flames of War, Field of Glory, etc. We’re doing open tables and hopefully a mass battle, depending on how many people we get. I’ll post pics after the event. I’m not sure how many folks here are in the Atlanta area, but all are invited. Pics from Saga Day! We ran 2 games, Vikings vs Anglo-Danes and Normans vs Carolingian Franks. After that we did a 4-way free for all, with Vikings, Normans, Carolingians, and Scots. I provided armies for the Vikings and Anglo-Danes for the demos. The tables were a homestead with manor house and fields, and a churchyard with cemetery. Carolingians vs Normans: Clash of Warlords scenario. Basic meet and greet fight. Carolingian Franks swarm around a homestead. The player says playing is motivation to paint, so here's hoping these guys get some color soon. Vikings vs Anglo-Danes: Desecration scenario. 3 objectives each, massacre VP's as normal, but the limit you can collect is based on how many of your opponent's objectives remain. Tense moment in the 4-way fight as my Viking Warlord faces down Norman knights. It was the Battle Royal scenario, with added objectives to give bonus VP's for control. A Sudan/Mahdist game. Sadly I wasn't involved but looks great. Forts, riverboats, there's a train at the other end of the table and thousands of Mahdists. You should give Sword and Spear a try too. Simpler than Impetus (uses the same basing though), far better than DB*. So several months later I've given Sword and Spear a try. I really like it! As a small-scale game with more complexity than DBA its much better than Impetus. I'll post some more thoughts later, but for now a tangentially related question: does there exist an ancients game that models the most common use of Elephants in Hellenistic and (attested) early Indian warfare, in which they were strung out infront of the infantry battle line? All the games I've looked at brigade elephants together into powerful shock units, and using them in front of anything is usually a terrible idea with all those "kill allies on recoil"-type rules. To the Strongest! has rules for elephant screens in the Even Stronger! rule downloads. I'm not too familiar with many systems' takes on war elephants. Field of Glory treats them as small dangerous battle groups of 2 bases (representing 10-20 elephants or so). They hit quite hard and really mess with enemy morale, but are also somewhat fragile. If they take on stronger/more disciplined combatants, or get exposed to skirmish or bow fire, they can get broken in short order. In FoG, if a battle group is reduced to 1 stand it auto-breaks; the 2-stand battle groups of elephants are prone to getting knocked out, which can lead to a cascade of morale problems in nearby units. This might be FoG's way of representing their difficulties in controlling them and their habit of panicking sideways through their own lines. Thus despite their historical use as a wall of moving death, using them in game like that just gets them killed. In the van he stationed his elephants at intervals of about a hundred feet, on a broad front, to form a screen for the whole body of the infantry and to spread terror among the cavalry of Alexander. He did not expect that any enemy unit would venture to force their way through the gaps between elephants, either on foot or on horseback; terror would make the horses uncontrollable, and infantry would be even less likely to make the attempt, since they would be checked by his own heavy infantry and then destroyed by the elephants turning upon them and trampling them. Behind the elephants were the footsoldiers, though not on a front of equal extent; the various units, forming a second line, were so disposed as to fill the intervals in the line of elephants. On both flanks of the infantry were the mounted units, each with a screen of war-chariots. Arrian credits him with 120 elephants, which gives a frontage of about 3-4km. Unlike the Persian Imperial armies, his numbers for the Indian campaign are plausible, and give a ratio of 1 Elephant to 150 infantry. Interestingly, the chariots seem to play a similar role for the cavalary as the elephants do for the infantry. Arrian's account is also inconsistent with most games rating Classical Indian infantry as archers with little close combat prowess. As far as I'm aware, Jhelum is the only major battle fought by an Indian army in antiquity for which we have a detailed account. There's obviously a wealth of surviving literature from ancient India, but no tradition of historical writing in the vein of Thucydides or Sima Qian. So events have to be reconstructed from epigraphy, later traditions, references in non-historical texts and foreign sources. The first three are obviously light on tactical details, and the latter focused on interactions with the Hellenistic world. On his left wing Eumenes stationed Eudamus, who had brought the elephants from India, with his squadron of one hundred and fifty horsemen, and as an advance guard for them two troops of selected mounted lancers with a strength of fifty horsemen...[lots of other cavalry units follow, with a total strength of 3600]. In front of all these he drew up forty-five elephants in a curved line with a suitable number of bowmen and slingers in the spaces between the animals. When Eumenes had made the left wing strong in this way, he placed the phalanx beside it...In front of the whole phalanx he placed forty elephants, filling the spaces between them with light armed soldiers. On the right wing he stationed cavalry...Along the whole of the wing he drew up forty elephants. The entire army of Eumenes consisted of thirty-five thousand foot soldiers, sixty-one hundred horsemen, and one hundred and fourteen elephants. Antigonus' deployment was similar, but being weaker in elephants elected to skirmish with light cavalry on one wing and advance in echelon, allowing parity on the other. He had fewer in the centre in front of his phalanx, and it was here that the battle was decided, though Diodorus attributes this to the scarcely credible prowess of the Agyraspides.